[[Ride the wind and dream with Air Play, a modern spectacle that brings to life the very air we breathe. 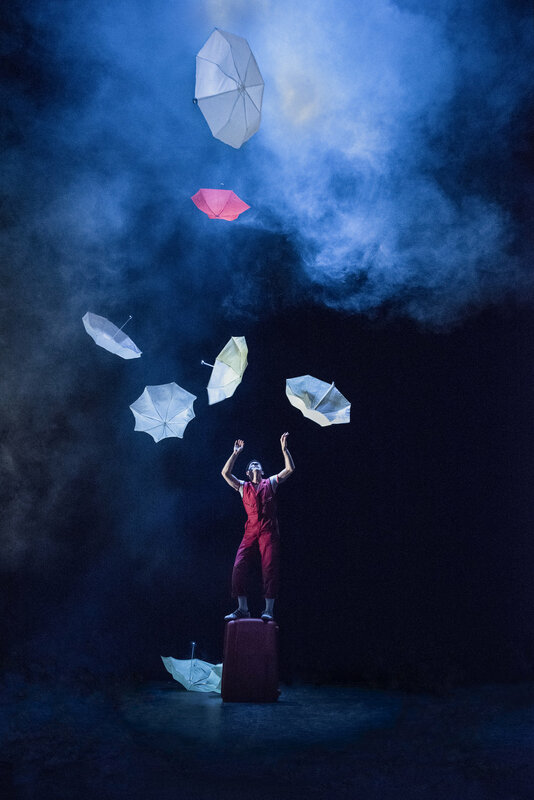 Flying umbrellas, larger-than-life balloons, giant kites floating over the audience, and the biggest snow globe you’ve ever seen will make you gasp in wonder and laugh until it hurts. Air Play is a circus-style adventure of two siblings journeying through a surreal land of air, transforming the ordinary into objects of uncommon beauty. 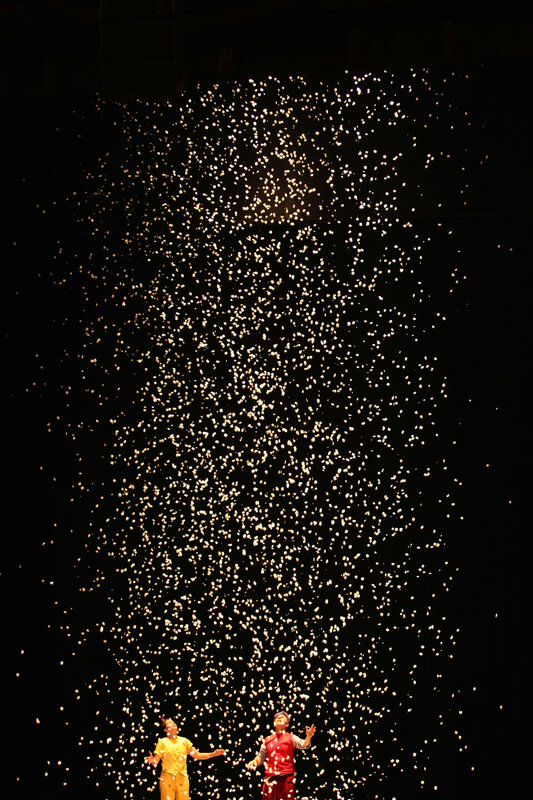 Fabrics dance in the wind, balloons have a mind of their own, confetti turns into the night sky, and an enormous canopy of hovering silk forever alters their future. 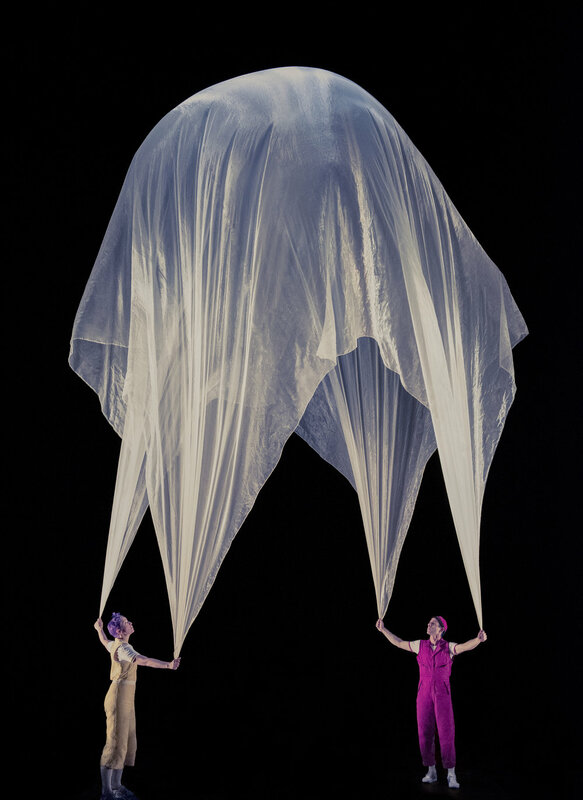 The creation of husband & wife team Seth Bloom and Christina Gelsone, Air Play merges their circus and street theater performance art with the sculptural artistry of Daniel Wurtzel. With visual images seemingly sewn from the sky, this poetic ode to childhood will enchant and electrify the young and young at heart.///Reite die Lüfte und träume mit Air Play, einem modernen Spektakel, das die Luft zum Leben erweckt. Fliegende Regenschirme, überlebensgroße Ballons, gigantische Drachen, die über das Publikum schweben, und die größte Schneekugel, die je gesehen wurde, werden Erstaunen und Lachen hervorrufen. Air Play ist ein Zirkus-Abenteuer von zwei Geschwistern, die durch ein surreales Land der Luft reisen und das Gewöhnliche in Objekte von ungewöhnlicher Schönheit verwandeln. Stoffe tanzen im Wind, Ballons haben ihren eigenen Geist, Konfetti verwandelt sich in den Nachthimmel, und ein riesiger Baldachin aus schwebender Seide verändert ihre Zukunft für immer. 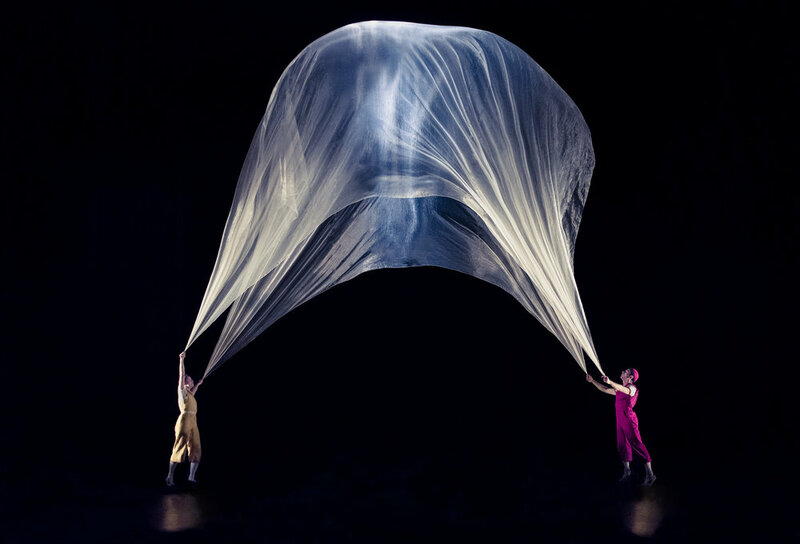 ...the main props of "Air Play" — balloons (including ones so large that the clowns could disappear inside them), long bolts of translucent cloth, ... — are so delicate, so fragile, so light as air. You feel you're witnessing divine natural occurrences rather than carefully devised circus stunts. You feel as if you've stepped into an enchanted world somewhere between childhood and what comes afterwards, where normal rules (gravity included) have been temporarily held at bay … A joy from start to finish. Stage Size: Min 10m x 10m / Height clearance of 13m.